This package contains components to model the movement of 1-dim. rotational, 1-dim. translational, and 3-dim. mechanical systems. 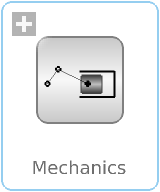 Note, all dissipative components of the Modelica.Mechanics library have an optional heatPort connector to which the dissipated energy is transported in form of heat. This connector is enabled via parameter "useHeatPort". If the heatPort connector is enabled, it must be connected, and if it is not enabled, it must not be connected. Independently, whether the heatPort is enabled or not, the dissipated power is available from variable "lossPower" (which is positive if heat is flowing out of the heatPort).